It’s been a while since we’ve posted here, but a lot has been going on with Otherworld Exotics in the interim. 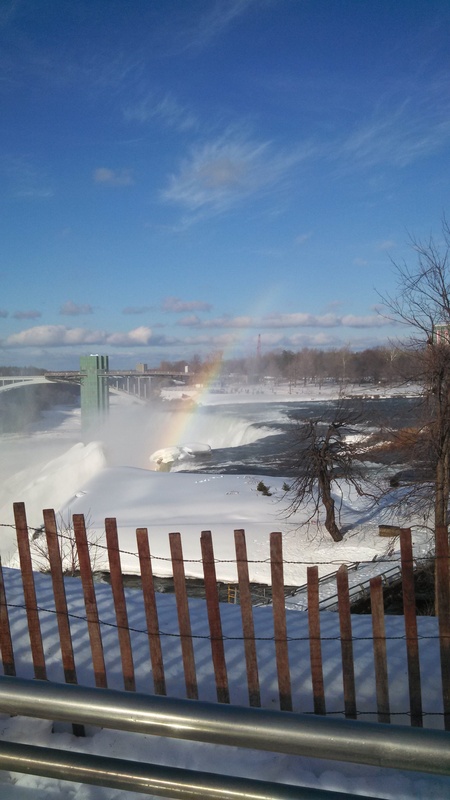 Just a few short weeks ago we took a trip up to Buffalo, New York to visit the incomparable Hog Heaven Hedgehogs. 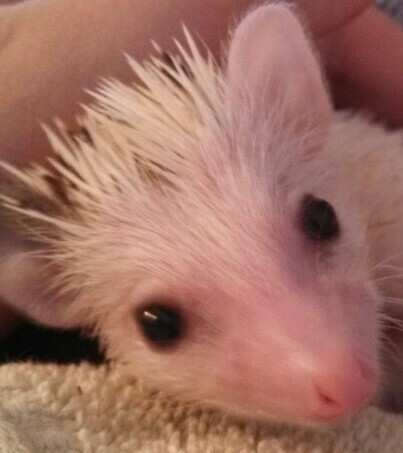 We got to visit their hedgehogs and tenrecs, and more importantly, add two new beautiful girls to our herd. Here are our new girls! Jenny is around 10 weeks old and a bit, well, large for her size. It seems that as each of her siblings got adopted she began making up for the loss by eating their food, and eventually was eating for six. Oops. She’s been put on a diet since she joined us, and happily given a wheel. It’s rather amusing seeing a hedgie have to jog rather than run, but she’s been steadily decreasing in girth in a healthful way. Jenny has a need. A need for speed. Your hedgehog is what? Tickling the urchin. One of the many delights of the hedgehog is how incredibly weird they can be. It’s been said that one of the biggest problems encountered when attempting to do a scientific survey of the species is the difficulty of stating any generalizations about them. The males may be bolder than the females… except for these females. The females may typically be larger than the males, but here are some big boned boys. It seems that the hedgehog endlessly contradicts any attempts at classification. But isn’t that part of their wonder? 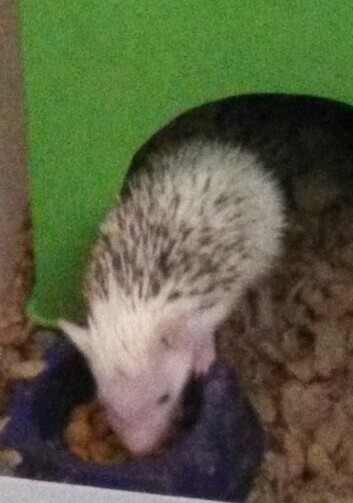 Every hedgehog owner has their stories of just how odd their hedgie’s behavior is! 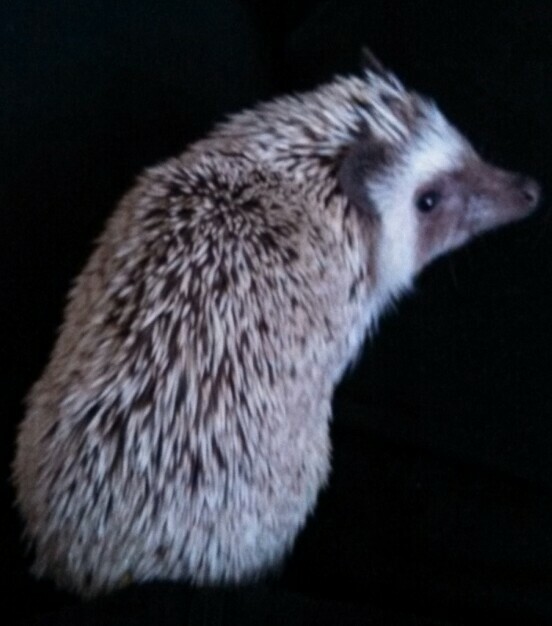 For instance, our boy Sebastian has a a very special distinction that none of our other hedgies quite have. 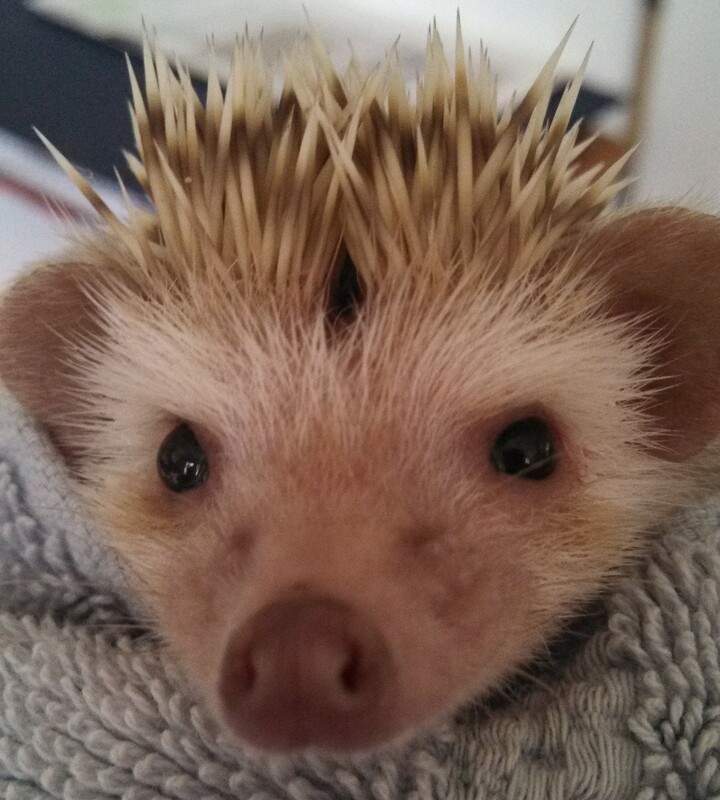 When we first rescued him, he was often just a spiky ball of quills. He refused to open up to us – not for treats, not for food, not for anything. We even set him down with one of our females. Would he open up to say hi to her? She licked his quills and he complained in huffs and growls that really, really confused the girl. She eventually gave up. He seemed satisfied then. 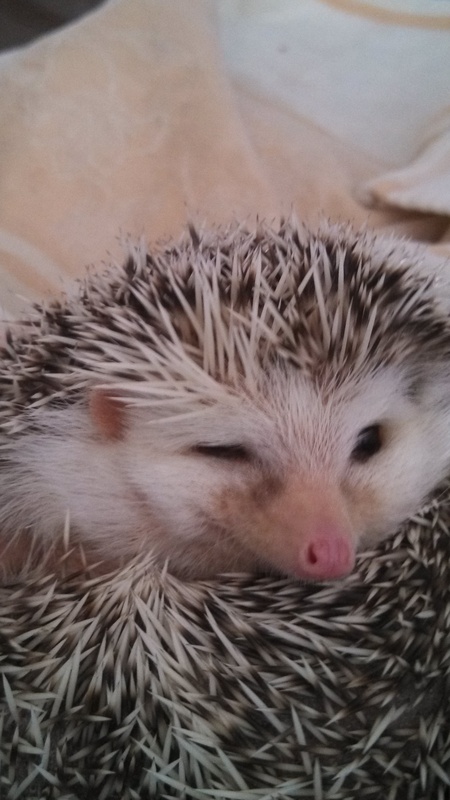 As satisfied as a ball of spikes can be. There was only one way to get him to uncurl for any amount of time. The uncurling was important, as it let us feel his belly to see if his fever had broken and touch him more so he could gradually get acclimated to it. Nowadays Sebastian is a very playful, much more gentle individual. He enjoys being held to some degree, enjoys cuddling much more when we don’t touch him. He’s mouthy, much more vocal than the others. He’s still quite a piece of work, but at least now he’s healthy and a good pet. And he’s still extremely, extremely ticklish. 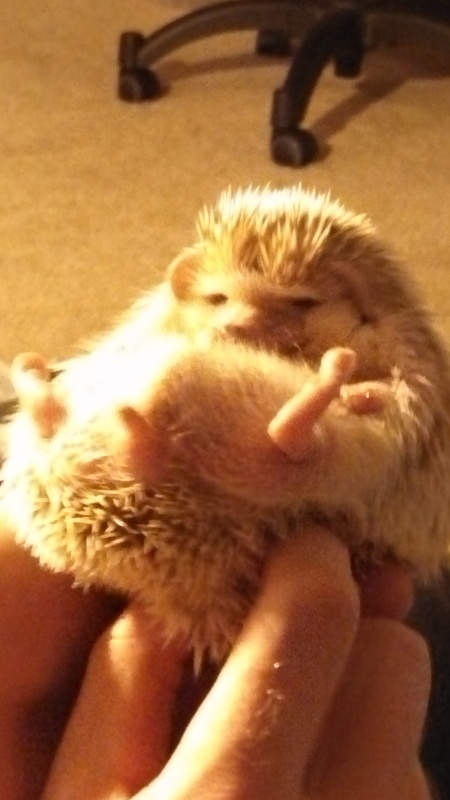 More than any of our other hedgies Sebastian enjoys being tickled. He stretches out into it and uncurls from a ball. He relaxes into it to the point that sometimes his front legs are up above his head and his eyes are shut in an expression of bliss. It works on both sides – between his shoulders and near the base of his spine. It’s utterly ridiculous. He stops complaining when we do it, and sort of flops back and lets us have at it. It’s truly an experience, tickling a hedgehog. This trick can be especially helpful at the vet. If you have a hedgehog that complains during its annual visit, I recommend you give tickling a try. A tentative try. The spines can be difficult to work your fingers between, but practice does make perfect. Sometimes even just rubbing the tips with your fingers can initiate this sort of response. I warn that this trick won’t always work, but when it does it’s truly hilarious to see. There are a lot of strange notions going around about how to house a hedgehog. Assuming we’re speaking of a pet hedgehog, and not a wild one, there really isn’t a great deal of work needed to set-up a cage that your hedgie would be happy to live in. There are a great deal of options when it comes to putting together a more complex setup, but for now we’re going to focus on the basic design. Consider this a beginning hedgehog home. What type of cage should I use? The short answer is: No cage. The cages that are used for small animals like a gerbil or a hamster would be far too small to house a hedgehog. The larger cages for ferrets and rats would be not only too large, but also contain wire mesh or metal bars which are to be avoided at all costs in hedgehog cages. Hedgehogs have a tendency to try to climb, and their bodies and legs aren’t built for it.. Wire mesh, even if it is tiny, is a perfect size for trapping toenails and tearing them out. Even if it doesn’t tear, it can break toes and injure paws to the point of amputation. Likewise, the wire bars can catch thin hedgie legs and ankles and break bone or cut off circulation. One of the most common problems hedgehogs suffer come from inadequate cages. I’ve heard a lot of mention of aquariums as hedgehog cages, and that is also not the best idea. While aquariums can come in the right sizes to house the animals, they offer poor ventilation and tend to capture heat. It’s easy to overheat a hedgehog in such a cage and they are prone to suffer heat stroke and heat exhaustion. The best cage for a hedgehog then? The best option for keeping hedgehogs is a large plastic tub. 105qts is the minimum size tub a hedgehog can be kept in, but the best dimensions tend to be 24″ x 36″. It’s vital to ensure that the sides of the cage are large enough that the hedgehog can’t climb out of it, even if it gets on top of other items within the cage. Now, you may be worried that the cage is too small for the hedgie at that size. Honestly, it isn’t. 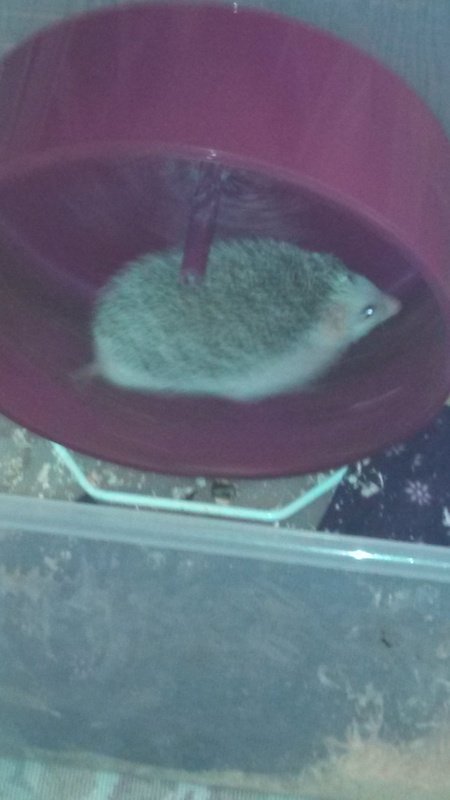 If the hedgehog has too much space it’ll go crazy trying to figure out what to go in it. They’re prone to OCD like behaviors if given too much space, and can be watched running back and forth repeatedly and rearranging items in an obsessive way. 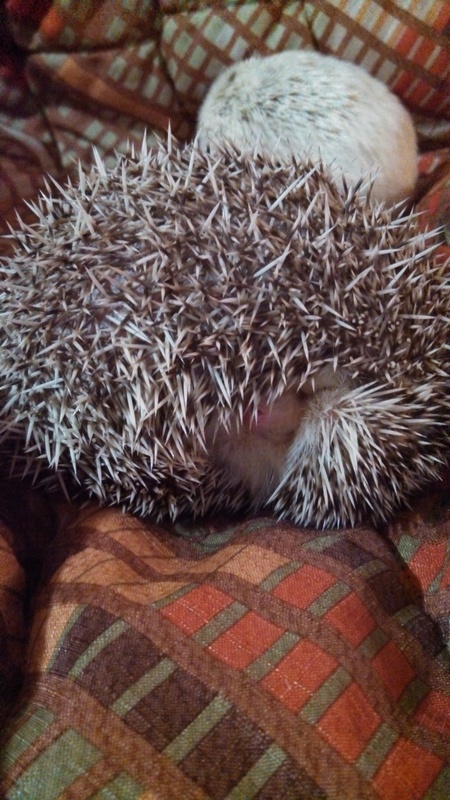 Too little space and the hedgehog will get depressed and may start self-mutilating. The plastic tubs are the cheapest option, and the easiest one to work with when it comes to setting up the remainder of the cage. They can be bought at most shops, including even the larger chain grocery stores if you look into the storage sections. Help Legalize Hedgehogs in Pennsylvania! 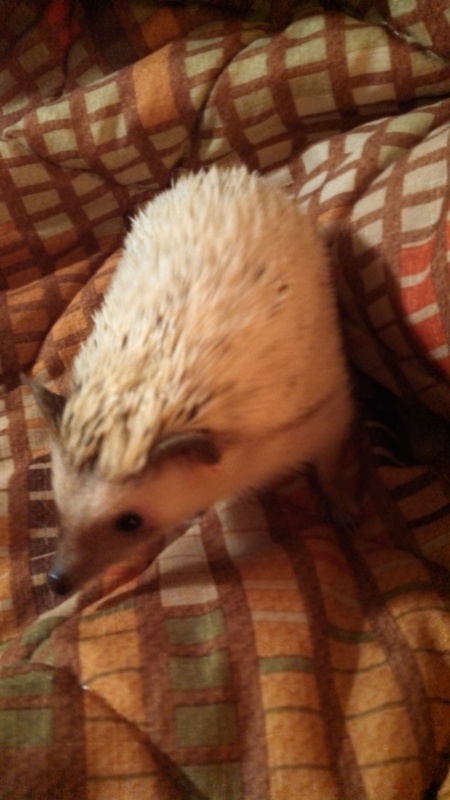 Do you live in Pennsylvania and want a pet hedgehog? Well now is your chance to have your very own! We are a group of students at Temple University working to legalize hedgehogs as pets in the state of Pennsylvania. We are petitioning for the House Bill 575 to be passed by the senate and we need your help! Please sign the petition below to get on board in legalizing hedgehogs as pets! 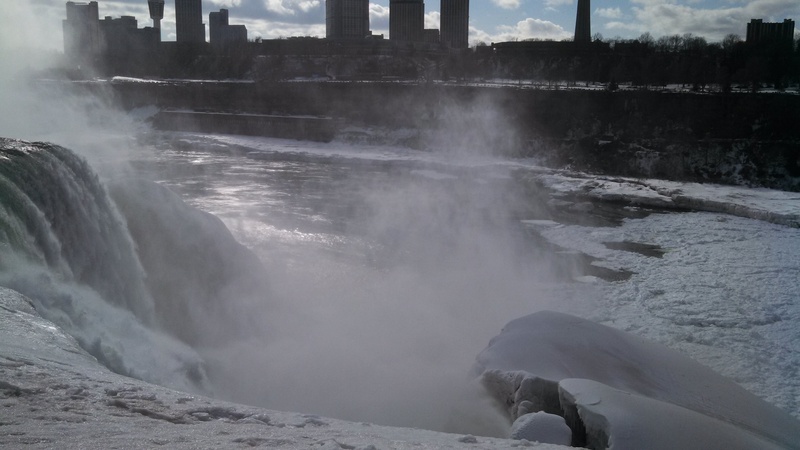 Hedgehogs cannot survive cool climates below 70 degrees and the cold winters of Pennsylvania would pose a problem if a hedgehog did in fact get out. Therefore there is no real threat of hedgehogs becoming an invasive species in the state of Pennsylvania. State Representatitve Jeff Pyle says “The species poses no risk to Homo sapiens.” and fully supports the legalization of hedgehog ownership in Pennsylvania. These hedgehogs make lovely pets and can be very educational for children by teaching them the responsibility of caring for another life. Please legalize hedgehogs in the state of Pennsylvania, as they pose no threat to our ecosystem and only benefit the lives of children and adults who adore these beautiful creatures. 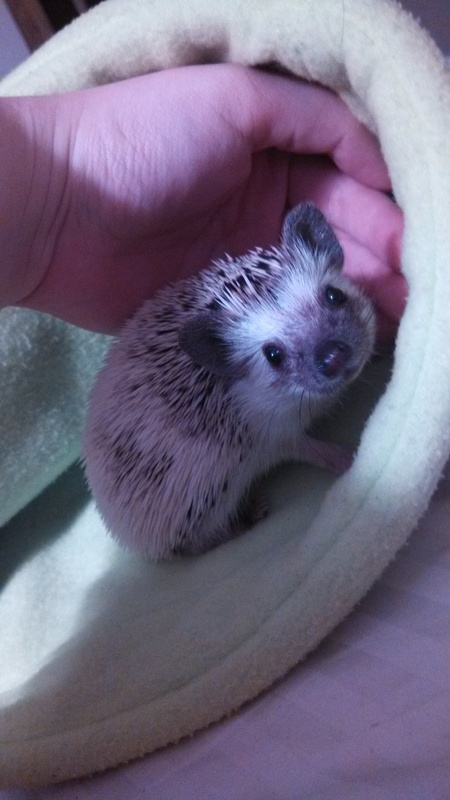 So, you’ve decided that a hedgehog is the right pet for you. Now how do you go about getting one? Some big pet stores, especially here in the DC Metro Area, have begun carrying hedgehogs in the small animal sections of their stores. Most exotic pet shops carry them. While it may be tempting to just purchase one there that not a good idea when it comes to hedgehogs. While some shops may be wonderful, the vast majority of them are ill equipped to house hedgehogs and the employees not terribly knowledgeable when it comes to how to care for them. They’re an unusual pet, and uncommon enough that even the most widespread book on hedgehog care is 15 years out of date and riddled with inaccuracies. This leaves us with the smart option: a breeder. Like pet shops, not all breeders are alike. You need to find the one that is right for you. People breed hedgehogs for different reasons, but any good breeder will primarily breed for health and temperament, everything else coming after those two vital points. Decide if you are after a show hedgehog, want specific markings or traits, and what personality you might be searching for. A good breeder will provide a warranty against things like Wobbly Hedgehog Syndrom (WHS), will take the hedgehog back if for some reason you’re not satisfied, and will be willing to help you if you have questions along the way. Avoid breeders who aren’t willing to discuss the parents of your hoglet, are willing to give the hoglets up before the 6 week weaning, or are reticent in answering questions about the hoglets upbringing. A good breeder will want to help you, and will be eager to help you choose the hoglet right for you. Before choosing a hedgehog it’s important to meet them. 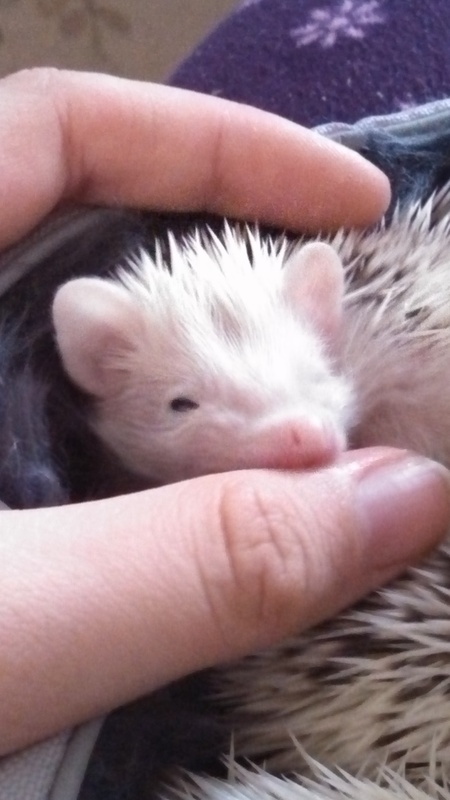 Ask about the hoglets personality before you purchase it, and make certain to handle it prior to, or at, the pick up. The hoglet should be active and curious. Ensure that the baby does more than just curl into a ball and spike up when being handled, and reconsider your decision if the hedgehog begins to hiss, pop, or make a harsh barking/clicking sound. An unwillingness to unroll and these aggressive displays are markers you do not want to encounter in your new pet. The hoglet may nibble and lick, but none of these should be outright bites.Self-anointing is something that you very much want to see in a new pet, as it’s a sign of happiness and trust. 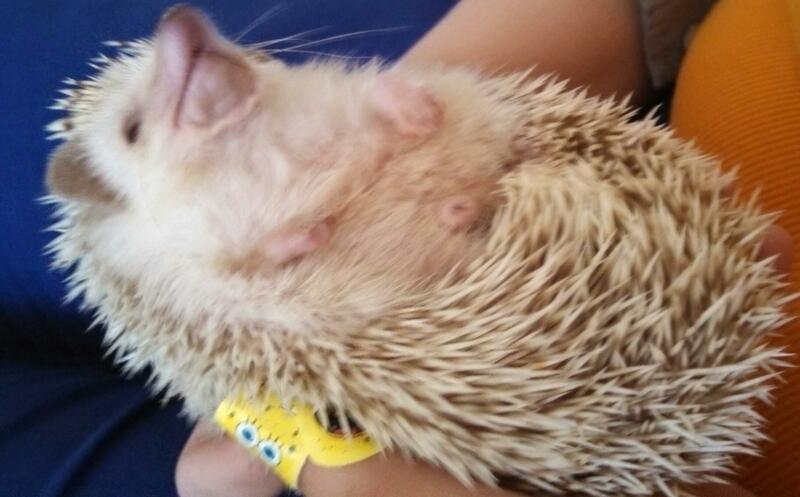 You want to be able to pet the hedgehog and to let it explore you. 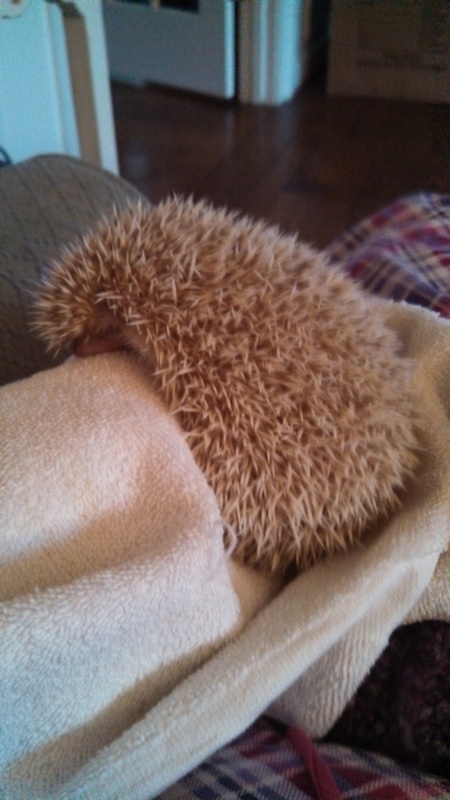 If you are more wanting a cuddly hedgehog, you should be quite happy if it falls asleep on you. Listen for purrs, but don’t be surprised if you don’t get them this soon. A good guide for what you want to look for would be the Hedgehog Standard used in hedgehog shows. While obviously your new pet doesn’t need to be show quality, the standard is still a very good indicator of health in hedgehogs and what all breeders should strive for. It is worth familiarizing yourself with what the ideal hedgehog would look like so you can avoid any unforeseen troubles with your new pet. 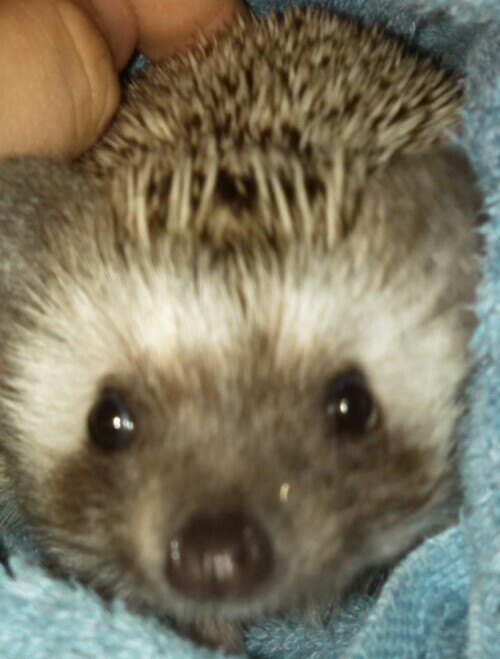 Your hedgehog’s face should be wide with the muzzle line being straight and short. Its eyes should be wide apart and bright and alert. The ears should be large and spaced well apart and velvety to the touch. They shouldn’t appear crusty or ragged. Big ears, short muzzle, wide face with good lines. The hedgehogs body should be an oval shape with the rump being a gentle curve. From the side the hedgehog’s body should also present a nicely curved line. The hedgehog should be able to curl into a ball and hide its face, an inability to curl completely is a sign of obesity which is a large health risk to the hedgehog. Front feet should have five toes, and back feet should have four. The legs should be long and elegant, not noticeably bowed or hockeyed. All legs should be functioning. At a very young age hedgehogs are liable to damaging their toes and/or losing them. If your hedgehog has incurred this injury the breeder should tell you before you pick the hedgehog up. It doesn’t ruin their mobility, and isn’t life threatening – but it is something a good breeder would inform you of. The quills should be full and evenly spaced over the body. You shouldn’t be able to see any sparse patches, or any real breaks in the dispersion. The quills should be straight and strong and have the feel of a bristle brush when you run your hand over them. You shouldn’t see any twisted or curly quills, and no ingrown quills. I hope this helps you find a good hedgehog!